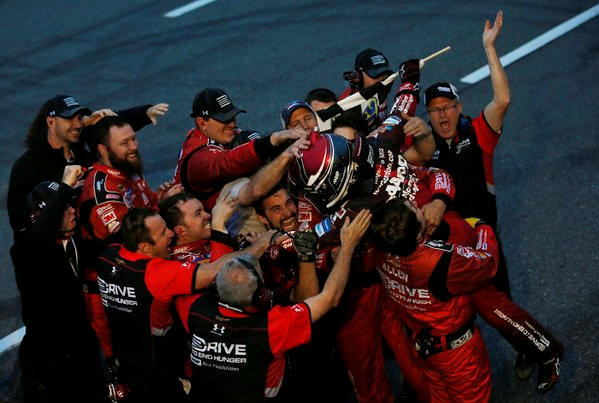 Jeff Gordon won the Goody’s Headache Relief Shot 500 at Martinsville Speedway, and secured himself a spot in the final race – at Homestead-Miami Speedway on Nov. 22nd – to determine the 2015 NSCS championship. Following Gordon to the drop of the checkered flag by 0.335 seconds was Jamie McMurray finishing second, Denny Hamlin third, Dale Earnhardt Jr. fourth and Kyle Busch finished fifth. Round out the top-10 finishing positions were Martin Truex Jr. claiming sixth, Ryan Newman seventh, Kevin Harvick eighth, Kasey Kahne ninth and Tony Stewart brought home 10th. Time of Race: 03 Hrs, 46 Mins, 35 Secs. Up Next: The AAA Texas 500 at Texas Motor Speedway on Sunday, Nov. 8th, with an approximate starting time of 2:20 p.m. (ET) on NBC. 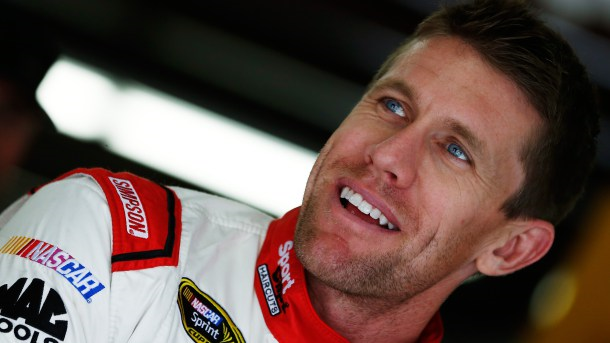 NASCAR Sprint Cup Series (NSCS) driver, Carl Edwards- with a lap speed of 136.894 MPH – was the quickest early Friday afternoon during the first SYLVANIA 300 practice session at New Hampshire Motor Speedway (NHMS). Six-time series champion, Jimmie Johnson was second quickest in the session with a lap speed of 136.311 MPH, and he was followed by Brad Keselowski (136.155 MPH) who was third, Kyle Larson (136.058) fourth and Kurt Busch (136.019) was fifth. Rounding out the top-10 quickest drivers in the practice were Dale Earnhardt Jr. (135.757 MPH) who was sixth, Jamie McMurray (135.709) seventh, Jeff Gordon (135.665) eighth, AJ Allmendinger (135.477) ninth, and Matt Kenseth (135.434) posting the 10th-quickest lap speed. Qualifying to determine the starting lineup for Sunday’s race will be held later this afternoon at 4:45 p.m. ET 0n NBCSN, and it is Brad Keselowski who holds the current series qualifying track record of 140.598 MPH at NHMS – which he set here last year (09/19). On Saturday, the qualified teams will have two more practice session beginning with a morning session from 9:00 a.m. – 9:55 a.m. ET on NBCSN, and then their “Happy Hour” (final) practice from 11:30 a.m. – 12:2019 p.m. ET on NBCSN. The 19th annual SYLVANIA 300 is scheduled to get underway around 2:20 p.m. (ET) Sunday afternoon, on NBCSN. 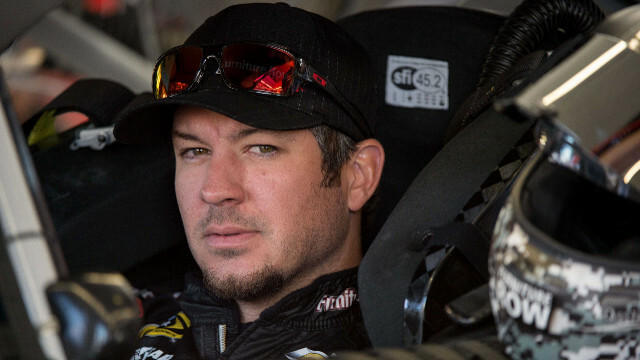 Martin Truex Jr., with a lap speed of 183.312 mph, was the quickest Saturday afternoon during the second NASCAR Sprint Cup Series (NSCS) practice session for Sunday’s myAFibRisk.com 400 at Chicagoland Speedway. Second quickest in the session was Denny Hamlin with a lap speed of 182.389 mph, and he was followed by Jeff Gordon (181.830 mph) who was third, Austin Dillon (181.616) fourth and Brad Keselowski (181.580) was fifth. Rounding out the top-10 quickest drivers in the practice were Jimmie Johnson (181.488 mph) who was sixth, Sam Hornish Jr. (181.257) seventh, Joey Logano (181.129) eighth, Kyle Busch (180.995) ninth and Kurt Busch (180.983) posting the 10th-quickest lap speed. “Happy Hour” (final) practice is scheduled for later this afternoon from 4:30 p.m. – 5:20 p.m. ET on NBCSN. The 15th annual myAFibRisk.com 400 is scheduled to get underway around 3:20 p.m (ET) Sunday afternoon on NBCSN. After a green-white-checkered (flags) dash to the finish in Sunday’s NASCAR Sprint Cup Series (NSCS) FedEx 400 benefiting Autism Speaks, it was Jimmie Johnson finishing ahead of Kevin Harvick (by 0.435 seconds) to win at Dover International Speedway. 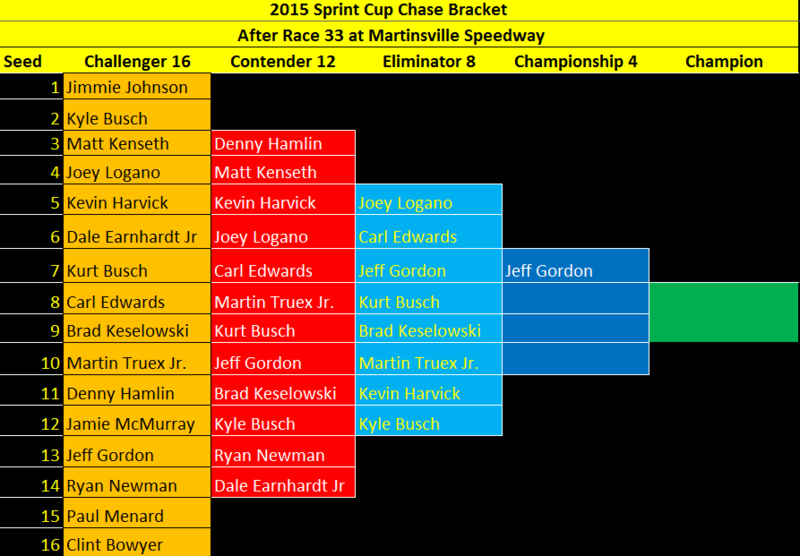 Following Johnson and Harvick to the drop of the checkered flag were Kyle Larson finishing third, Kasey Kahne fourth and Aric Almirola finished fifth. Martin Truex Jr., who led the most laps – 131 out of 405, finished in sixth-place, while Jamie McMurray finished seventh, Paul Menard eighth, Clint Bowyer ninth and Jeff Gordon rounded out the top-10 finishing positions. With his second-place finish, Kevin Harvick leaves Dover with a 44-point lead over Martin Truex Jr.
Time of Race: 3 Hrs, 23 Mins, 16 Secs. Next Up: The Axalta “We Paint Winners” 400 at Pocono Raceway on Sunday, June 7th, with an approximate starting time of 1:20 p.m. (ET), and television coverage provided by FOX Sports 1. Saturday night at Charlotte Motor Speedway, it was pole-sitter Danny Hamlin holding off Kevin Harvick – by 0.923 seconds – to win the 31st running of the NASCAR Sprint Cup Series (NSCS) Sprint All-Star race and a million dollars. Kurt Busch finished in third behind Hamlin and Harvick, and they were followed by Jeff Gordon finishing fourth and Matt Kenseth taking fifth-place. Rounding out the top-10 finishing positions were Kyle Busch finishing sixth, Kasey Kahne seventh, Joey Logano eighth, Brad Keselowski ninth and Dale Earnhardt Jr. bringing home 10th-place. Time of Race: 01 Hrs, 33 Mins, 00 Secs. Next Up: Back to racing for points and the longest race of the season with the Coca-Cola 600 at Charlotte Motor Speedway on Sunday, May 24th, with an approximate starting time of 6:20 p.m. (ET). Hendrick Motorsports take 4 of the top-5 starting positions for Sunday’s NASCAR Sprint Cup Series (NSCS) GEICO 500, as Jeff Gordon – with a qualifying lap speed of 194.793 MPH – captured the pole Saturday at Talladega Superspeedway (TSS). 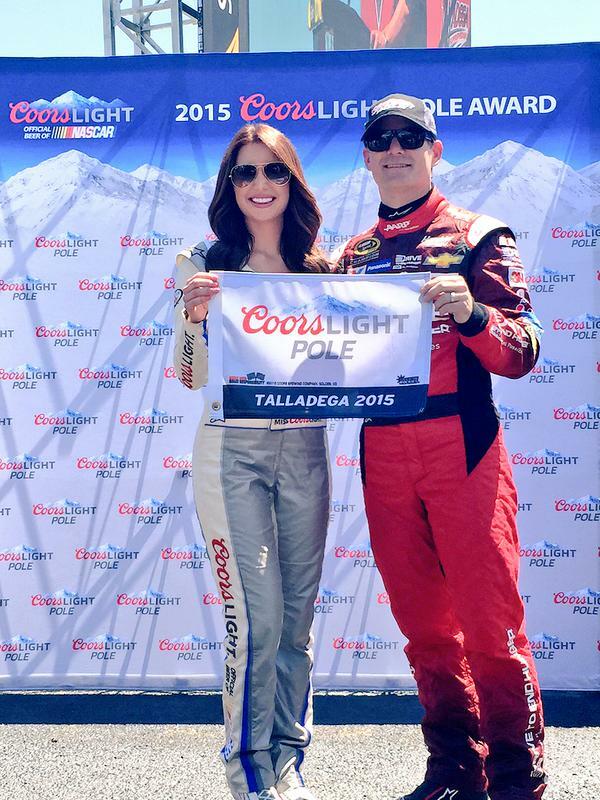 This was Gordon’s third series pole and sitxh top-10 start of the 2015 season, his 80th series career pole and his fourth series pole at Talladega Superspeedway. Gordon’s fellow teammate, Kasey Kahne (193.685 MPH) will start second on the outside pole, and they will be followed by Ryan Blaney (193.611) starting third, while the rest of the Hendrick Motorsports stable of Dale Earnhardt Jr. (193.599) and Jimmie Johnson (193.427) start fourth and fifth respectively. Rounding out the top-10 starting positions will be Tony Stewart (193.419 MPH) starting sixth, Paul Menard (193.412) seventh, Matt Kenseth (193.357) eighth, David Ragan (193.006) ninth and Clint Bowyer (192.808) will start from 10th. There were two drivers that failed to make the 43-car field starting lineup, and they were series Rookie of the Year (ROTY) candidate, Jeb Burton and driver Michael McDowell. From the pole to victory lane, Matt Kenseth broke a 51-race winless streak Saturday night, as he held off Jimmie Johnson in the NASCAR Sprint Cup Series (NSCS) Food City 500 in Support of Steve Byrnes and Stand Up to Cancer at Bristol Motor Speedway (BMS). 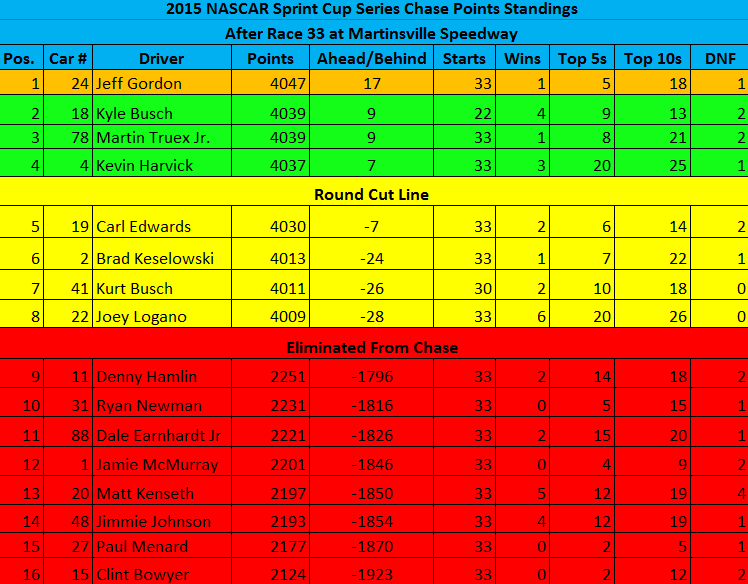 Following Kenseth and Johnson to the drop of the checkered flag were Jeff Gordon finishing third, Ricky Stenhouse Jr. fourth and Ryan Newman finished fifth. Rounding out the top-10 finishing positions were Tony Stewart claiming sixth, Kyle Larson seventh, Justin Allgaier eighth, Danica Patrick ninth and Austin Dillon brought home 10th. The current series points leader, Kevin Harvick, was involved in an incident that resulted in a 38th-place finish, and leaves Bristol with a 30-point lead over Joey Logano – who was also involved in an incident and finished 40th. Time of Race: 3 Hrs, 37 Mins, 54 Secs. Next Up: The Toyota Owners 400 at Richmond International Raceway on Saturday, April 25th, with an approximate starting time of 7:20 p.m. (ET), and FOX will provide television coverage of the race.